A. Charlois discovered asteroid #423 Diotima. Gerard Peter Kuiper, born Gerrit Pieter Kuiper (7 December 1905 - 23 December 1973) was a Dutch-American astronomer. Born and educated in the Netherlands, he moved to the United States in 1933. Kuiper discovered Uranus's moon Miranda and Neptune's moon Nereid. He also suggested the existence of a belt of trans-Neptunian objects outside Neptune's orbit, now confirmed, and named the Kuiper belt. Kuiper also pioneered airborne infrared observing using a Convair 990 aircraft in the 1960s, and helped identify landing sites on the Moon for the Apollo program. Leo Baekeland, of Yonkers, New York, received a patent for the first thermosetting plastic, Bakelite. J. H. Metcalf discovered asteroid #737 Arequipa. K. Reinmuth discovered asteroid #1078 Mentha. Wiley Post discovered the jet stream in the course of experiments with high-altitude flying and developing pressurized flight suits. The Convention on International Civil Aviation (also known as the Chicago Convention) was signed by representatives from 52 countries. NASA's Pioneer 3 re-entered the atmosphere after detecting the outer Van Allen radiation belt. Pioneer 3 was a spin stabilized spacecraft launched 6 December 1958 by the U.S. Army Ballistic Missile agency in conjunction with NASA. The spacecraft failed to go past the Moon and into a heliocentric orbit as planned, but did reach a maximum altitude of over 102,000 km before falling back to Earth. The revised spacecraft objectives were to measure radiation in the outer Van Allen belt area using Geiger-Mueller tubes and to test the trigger mechanism for a Lunar photographic experiment. The flight plan called for the Pioneer 3 probe to pass close to the Moon after 33.75 hours and then go into Solar orbit. However, propellant depletion caused the first stage engine to shut down 3.7 seconds early, preventing the spacecraft from reaching escape velocity. The spacecraft reached an altitude of 102,360 km (109,740 km from the center of the Earth) before falling back to Earth. It re-entered Earth's atmosphere and burned up over Africa on 7 December at approximately 19:51 UT. The probe returned telemetry for about 25 hours of its 38 hour journey, the other 13 hours were out of range of the two tracking stations. The data obtained were of particular value since they indicated the existence of two distinct radiation belts. NASA's Orbiting Astronomical Observatory 2 was launched and placed in a low-earth orbit, one of a series of automated astronomical observatories whose orientation was controllable from the ground. NASA launched the last manned Saturn V, carrying the Apollo 17 astronauts on the last manned Lunar landing mission to date (2018). Apollo 17 was launched 7 December 1972, the last manned mission launched by the Saturn V rocket, the eleventh manned space mission in the NASA Apollo program, and the sixth and last mission to date (2018) to land on the Moon. It was the first night launch, and the final mission, of the Apollo program. Crew members were Gene Cernan, commander; Ron Evans, Command Module pilot; and Harrison Schmitt, Lunar Module pilot. Approximately five hours after launch, while en route to the Moon, the crew took a photograph of Earth called "The Blue Marble" at a distance of approximately 55,000 km. It is one of the most widely distributed photograph images in existence. One of the last two men to set foot on the Moon was also the first scientist-astronaut, Schmitt, a geologist. While Evans circled in the command module "America," Schmitt and Cernan landed on the Moon on 11 December 1972. The crew collected a record 108.86 kilograms of rocks during three moonwalks, roamed 33.80 kilometers from the "Challenger" LEM through the Taurus-Littrow valley in their rover, discovered orange-colored soil, and left the most comprensive set of instruments in the ALSEP on the Lunar surface. At 05:40:56 GMT on 14 December 1972, Apollo 17 Mission Commander Gene Cernan returned to the Lunar Excursion Module (LEM), ending the last Extravehicular Activity (EVA) of what would prove to be the final expedition of the Apollo program. To date (2018), no other humans have yet returned to set foot on the Lunar surface, foisting on Captain Cernan the dubious honor and title of being "The Last Man on the Moon." The LEM ascent stage was released after Cernan and Schmitt returned to the Command Module, and impacted the Moon on 15 December 1972. Apollo 17 splashed down on 19 December 1972 at 17 deg 53 min S, 166 deg 7 min W, 350 nautical miles SE of the Samoan Islands and 6.5 km (4 mi) from the recovery ship USS Ticonderoga. 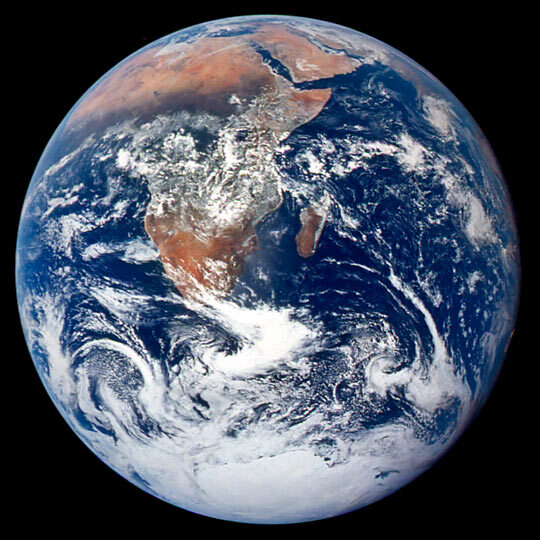 The crew of NASA's Apollo 17 took a photograph of Earth called "The Blue Marble" at a distance of approximately 55,000 km. It is one of the most widely distributed photographic images in existence. P. Wild discovered asteroid #2843. Purple Mountain Observatory discovered asteroid #3494. T. Seki discovered asteroid #2961 Katsurahama. NASA's Galileo spacecraft passed the North Pole of the Moon (Peary Crater). NASA's Galileo spacecraft arrived at Jupiter where it orbited the planet for nearly 8 years. A probe carried by NASA's Galileo spacecraft penetrated the atmosphere of Jupiter, the first man-made craft to do so. NASA's STS 80 (Columbia 21) mission landed after more than seventeen and a half days in space. Originally scheduled for a 31 October 1996 launch date, STS 80 was delayed by Hurricane Fran and concerns about nozzle erosion on the Solid Rocket Boosters (SRBs). At a follow up Flight Readiness Review (FRR) on 11 November, 15 November was set as the official launch date, pending a commercial Atlas launch 13 November, and the launch countdown began. Just two days later, the launch was postponed to 19 November because the Atlas launch was scrubbed and because of predicted bad weather in the KSC vicinity for period of several days, and the count remained in an extended hold. The launch on 19 November 1996 occurred about three minutes after the scheduled opening of the launch window due to a hold at T-31 seconds to assess hydrogen concentrations in the aft engine compartment. STS 80, the final Shuttle flight of 1996, was highlighted by successful deployment, operation and retrieval of two free-flying research spacecraft. Two planned extravehicular activities (EVAs) were canceled when the crew was unable to open the hatch due to a loose screw in an internal actuator. The Orbiting and Retrievable Far and Extreme Ultraviolet Spectrometer-Shuttle Pallet Satellite II (ORFEUS-SPAS II) free-flyer was deployed on flight day one to begin approximately two weeks of data gathering. Its mission was dedicated to astronomical observations at very short wavelengths to: investigate the nature of hot stellar atmospheres; investigate cooling mechanisms of white dwarf stars; determine the nature of accretion disks around collapsed stars; investigate supernova remnants; and investigate the interstellar medium and potential star-forming regions. All ORFEUS-SPAS II mission goals were achieved, and more than twice the data was obtained than on the first ORFEUS-SPAS flight. Wake Shield Facility-3 (WSF-3) was deployed on flight day 4. WSF is a 12 foot diameter, free flying stainless steel disk designed to generate an ultravacuum environment in its wake in which to grow semiconductor thin films for use in advanced electronics. Its third flight was highly successful, with a maximum seven thin film growths of semiconductor materials achieved and the satellite hardware performing nearly flawlessly. WSF-3 was retrieved after three days of free-flight. Other experiments conducted on STS 80 were: Space Experiment Module (SEM) to provide increased educational access to space; NIH-R4, fourth in series of collaborative experiments developed by NASA and National Institutes of Health, to investigate role of calcium in blood pressure regulation; NASA/CCM-A, one of a series of Shuttle bone cell experiments; Biological Research in Canister (BRIC)-09 experiment to study influence of microgravity on genetically-altered tomato and tobacco seedlings; Commercial MDA ITA experiment (CMIX-5), the last in its series of Shuttle experiments; and Visualization in an Experimental Water Capillary Pumped Loop (VIEW-CPL), a middeck experiment, to investigate a method for spacecraft thermal management. The crew also worked with the Space Vision System, designed to monitor the position and alignment of structures in space. The STS 80 mission ended when Columbia landed 7 December 1996 on revolution 279 on Runway 33, Kennedy Space Center, Florida. Rollout distance: 8,721 feet (2,658 meters). Rollout time: one minute, two seconds. Orbit altitude: 218 statute miles. Orbit inclination: 28.45 degrees. Mission duration: 17 days, 15 hours, 53 minutes, 18 seconds. Miles traveled: 7 million. The landing was originally scheduled for 5 December, but Columbia was waved off two days in a row due to weather conditions in Florida. This was the third time in the Shuttle program history that a landing was waved off twice consecutively due to weather followed by landing at the prime site on the third day (the other times were STS-57, 1993, and STS 61-C, 1986). The STS 80 flight crew was: Kenneth D. Cockrell, Mission Commander; Kent V. Rominger, Pilot; Tamara E. Jernigan, Mission Specialist; Thomas D. Jones, Mission Specialist; F. Story Musgrave, Mission Specialist. At age 61, Musgrave became the oldest human being to fly in space to that date. He also set a new record for the most Shuttle flights (six) and tied fellow astronaut John Young's record for the most spaceflights total. NASA's STS 108 (Endeavor) mission docked at the International Space Station. STS 108 was launched 5 December 2001, and docked at the International Space Station on 7 December 2001, where it remained until 15 December 2001. The mission ended when Endeavor landed on 17 December 2001. Orbit altitude: 122 nautical miles. Orbit inclination: 51.6 degrees. Mission duration: 11 days, 19 hours, 36 minutes. STS-108 was the 12th shuttle flight to visit the International Space Station, and the first since the installation of the Russian Pirs airlock. Endeavour delivered the Expedition Four crew -- Commander Yury Onufrienko and Flight Engineers Carl Walz and Dan Bursch -- to the orbital outpost. The Expedition Three crew -- Commander Frank Culbertson, Pilot Vladimir Dezhurov and Flight Engineer Mikhail Tyurin -- returned to Earth on Endeavour. The Student-Tracked Atmospheric Research Satellite for Heuristic International Networking Experiment (STARSHINE 2) was deployed from Endeavour's payload bay 16 December 2001, one day before landing. STS 113 was launched 23 November 2002, the 16th shuttle mission to the International Space Station (designated ISS Flight 11A). Orbit insertion altitude: 122 nautical miles. Orbit inclination: 51.60 degrees. During its 14 day mission, the STS 113 crew extended the International Space Station's backbone with installation of the P1 (P-One) Truss, and exchanged the Expedition Five and Six crews. About 1,969 kilograms (4,340 pounds) of cargo were transferred between the shuttle and station. Endeavour docked with the station 25 November and undocked on 2 December. Three EVAs were conducted. The mission ended on 7 December 2002 when Endeavour landed at Kennedy Space Center, Florida. Mission duration: 13 days, 18 hours, 47 minutes. The landing was the first time a mission ended on the fourth day of landing attempts. JAXA's Akatsuki Venus probe successfully fired its four hydrazine RCS thrusters for 20 minutes to enter orbit, five years later than planned when it was launched.